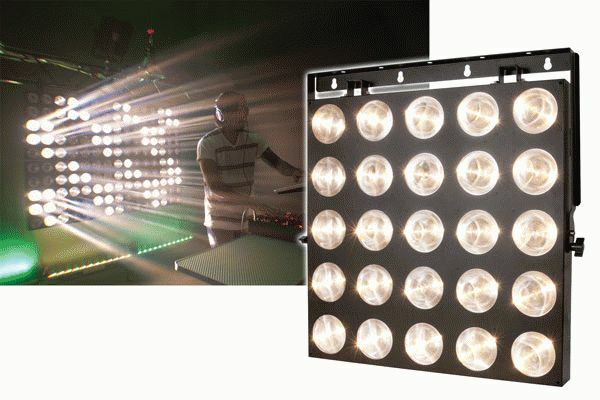 American DJ’s Matrix Beam LED is a 5’ x 5’square panel that can be set up anywhere to create instant electrifying blinder and/or chase effects for stages and mobile productions. Featuring 25 x 3-watt warm white Cree LEDs, arranged in five rows of five, the matrix-like effect emits intensely bright spots of light that move to built-in chase sequences and can even produce alpha-numeric characters via DMX control. Whether used as a backdrop for a DJ booth, an eye-popping chase effect in a club, or beaming out from the stage as an audience blinder, the Matrix Beam LED will add dramatic illumination to any venue or production. This stunning effect offers 3 operational modes – Auto (Program Run) Mode, Sound Active Mode, and DMX-512 Mode – providing a great degree of flexibility and user options. Set it in sound-active mode and it will run through exciting chase programs in sync with the music. Use a DMX controller to spell out names or promotional messages, and it becomes a billboard “in lights” for a performer or establishment. The Matrix Beam LED even has an easy-to-use latch system for linking multiple panels together, so you can display your lighting designs over larger areas. Emitting a 2° beam angle, the Matrix Beam LED includes such user programmable features as a variable speed strobe effect and 0-100% electronic dimming. When used with a DMX controller, it offers 3 different channel modes (1, 4 or 25 channels), for an array of programming options. Its DMX settings are easily accessible via a 4-button LED display on the rear panel. As another convenient control option, the Matrix Beam LED is compatible with American DJ’s UC3 Series of easy-to-use controllers (sold separately). A great-looking effect when used in multiples, the Matrix Beam LED features a built-in latching system for easy linking with other units. Each panel also includes IEC AC In/Out on the rear to daisy chain power for connecting up to 3 Matrix Beam LED units. A yoke and safety hook come attached to each panel. Cool running and flicker free, the Matrix Beam LED’s long-life LEDs are rated at 50,000 hours for low maintenance. For all its intensely bright, dramatic effects, the unit is extremely energy efficient, consuming just 66 watts of electricity at maximum use. Designed for mobile productions, the panels are easy to transport, measuring 23.75”L x 23.75”W x 4.5”D/ 600 x 600 x 114mm (26.25” x 26.5” x 4.5”/ 664 x 668 x 114 with handles). Each panel weighs 23 lbs./ 10.2 kg. The Matrix Beam LED features multi-voltage operation: AC 100-240V, 50/60 Hz. The MSRP of the Matrix Beam LED is $899.95.